uuid : 63b6117f-d5d8-4179-babc-f78cb5a658b8 templates_id: 119472 templates_uuid: "f6a472bc-9431-4859-a107-e69f274a69bf" title: "FRI Lease - Commercial Lease - Commercial Lease Template" display_name: "Commercial lease" meta_keywords: "FRI Lease, Full Repairing and Insuring Lease, Commercial lease agreement and Commercial lease terms" description: "
Rent out a whole building to a business using this commercial lease. This full repairing and insuring lease helps to regulate the relationship between landlord and tenant up to a maximum of three years. Clearly set out a tenant\'s obligations including repairing and maintaining the building using this FRI lease. This full repairing lease allows for assignment and subletting of the whole premises and allows for exclusion of security of tenure. It also allows the tenant or landlord or both to break the lease within an agreed time period. A commercial lease is an agreement between a landlord and a business for the rental of a property. It allows a business to use a property for commercial purposes, and it sets out the rights and obligations of the landlord and tenant. You need a commercial lease if you wish to carry on your business in a specific space. A commercial lease frames the relationship between landlord and tenant, and outlines the business purposes for which a property can be used. A carefully written commercial lease is essential to carry on your business properly, because as a tenant, you can only use the property for purposes that have been specifically set out in a \'permitted use of premises\' clause. How does a commercial lease differ from a residential lease? A commercial lease is used for business purposes, whereas a residential lease is used for the rental of a home. A commercial lease is usually subject to more negotiation than a residential lease, but offers less protection to the tenant, because they do not personally reside inside the property. In particular, commercial leases are not subject to most consumer protection laws that govern residential tenancies, eg caps on security deposits or rules protecting a tenant\'s privacy. An FRI (full repairing and insuring) lease means that all costs of maintenance, repair and insurance are born by the tenant. What is \'security of tenure\'? Security of tenure gives the tenant the right to remain in the property, i.e. to renew their tenancy when their lease comes to an end. Short-term commercial leases are usually \'excluded\' from the statutory right to a new lease when the current lease ends. For more information see Security of tenure. How can the commercial lease be terminated? A commercial lease may include a provision known as a \'break clause\', which allows either party to end the lease early if the relevant notice provisions in the lease are met. 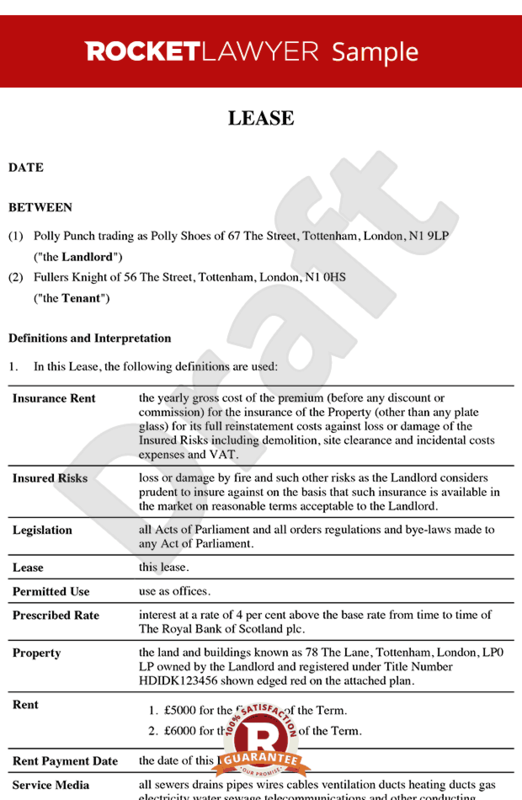 This commercial lease of the whole property is governed by the law of England and Wales. \r\n" created_timestamp: "2018-10-08 04:36:11.0" modified_timestamp: "2018-10-08 04:36:11.0" active: true created_by: 104 modified_by: 104 dcm_id: 321 url_slug: "Commercial-lease" meta_description: "Rent out a building to a business using this step-by-step FRI lease from Rocket Lawyer. " time_to_complete: "15 minutes"
Rent out a whole building to a business using this commercial lease. This full repairing and insuring lease helps to regulate the relationship between landlord and tenant up to a maximum of three years. Clearly set out a tenant's obligations including repairing and maintaining the building using this FRI lease. This full repairing lease allows for assignment and subletting of the whole premises and allows for exclusion of security of tenure. It also allows the tenant or landlord or both to break the lease within an agreed time period. You need a commercial lease if you wish to carry on your business in a specific space. A commercial lease frames the relationship between landlord and tenant, and outlines the business purposes for which a property can be used. A carefully written commercial lease is essential to carry on your business properly, because as a tenant, you can only use the property for purposes that have been specifically set out in a 'permitted use of premises' clause. A commercial lease is used for business purposes, whereas a residential lease is used for the rental of a home. A commercial lease is usually subject to more negotiation than a residential lease, but offers less protection to the tenant, because they do not personally reside inside the property. In particular, commercial leases are not subject to most consumer protection laws that govern residential tenancies, eg caps on security deposits or rules protecting a tenant's privacy. What is 'security of tenure'? Security of tenure gives the tenant the right to remain in the property, i.e. to renew their tenancy when their lease comes to an end. Short-term commercial leases are usually 'excluded' from the statutory right to a new lease when the current lease ends. For more information see Security of tenure. A commercial lease may include a provision known as a 'break clause', which allows either party to end the lease early if the relevant notice provisions in the lease are met. More than just a Commercial lease template, our step-by-step interview and guidance makes it easy to create your document. Easily create online, download, print and sign your free Commercial lease in minutes. This document is also sometimes called: FRI Lease, Full Repairing and Insuring Lease, Commercial lease agreement and Commercial lease terms.